President Barack Obama speaking in March 2012 at Sempra U.S. Gas & Power’s Copper Mountain Solar 1 Boulder City, Nev., facility, the largest photovoltaic solar plant in the U.S.
Van Jones started Green for All, a national nongovernmental organization focused on building a green economy strong enough to lift people out of poverty, because he saw a simple demand and an easy solution to it. There were people in communities of color who needed jobs and, to Jones, the most important work to be done is to repower America with clean energy. “I wanted to connect the people who most needed work with the work that most needed to be done,” the environmental advocate and civil rights activist tells The Root. "It just came out of being in Oakland [,Calif.,] seeing the opportunity with solar companies and organic-food companies popping up all over the place and knowing that they needed workers and entrepreneurs to get that product out,” he says. But then there came the downs, when the Senate refused to consider the American Clean Energy Security Act of 2009. However, Jones now sees new reasons for hope. It seems that clean energy is making a comeback tour, especially since the Obama administration recently announced a new initiative to make solar energy accessible to all Americans, particularly those of low income. It’s another step in the administration’s mission to address climate change and promote clean energy while creating new jobs. 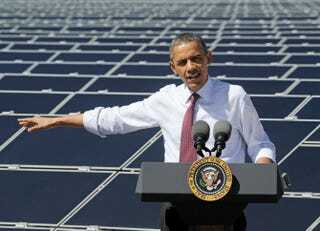 Green for All was one of the players that brought its influence to the White House, voicing concerns over the exclusion of people of color in the solar boom. Jones notes that the group had a meeting at the White House with officials, leaders from the Congressional Black Caucus and other leaders of color from Congress, and solar executives that preceded the White House’s announcement by a few weeks. “It’s an important victory because African Americans and other communities of color have been incredibly supportive of the solar industry and the solar industry has not yet been very supportive of [us],” the activist says. “This particular announcement by the White House gives us a whole new tool box for communities and solar companies to work together to increase the number of people of color working in the solar industry and to increase the number of homeowners of color who can now have solar panels on their roof tops,” he says. The initiative has set a new goal of tripling the amount of renewable energy installed in federally subsidized housing by 2020. It also hopes to make it easier for homeowners to borrow money, up to $25,000, for solar and energy-efficient improvements, among other ideas, including job creation. This means three important things for communities of color if done right: more work, more wealth and better health, according to Jones. “The solar industry is growing at about 10 times the rate of the rest of the economy, so if we can get in on the ground floor with these jobs, we’d have a lot more people employed. And it’s not [only jobs in] setting up the solar panels. It’s also the marketing and the sales and services of the product,” he says. As for wealth, “when you have solar panels in your house, your property value is higher and your energy bills are lower,” he says. And finally, in terms of health, renewable energy would hopefully see the end of what Jones calls “nasty, polluting power plants,” which black people disproportionately tend to live near. “[Power plants] keep our lights on but also keep asthma inhalers in our children’s pockets. If you can start retiring all these coal-fire power plants, then you also have better health," Jones says. "Solar done the right way can be a lifesaver in three respects for our communities, but done the way that the solar companies have been doing it, all it has been doing has been lining the pockets of solar executives and cutting bills for affluent people to take advantage of the existing programs,” Jones adds. So what’s next? The ball is now in the court of the solar companies, Jones says. If the initiative succeeds, tackling climate change would also be another triumph for Obama’s presidential record, according to Jones. “This is going to be a big part of Obama’s legacy. This brother is winning across the board. He’s strutting around now looking like George Jefferson, he pivot so hard,” Jones says. In the meantime, Green for All will continue to do its part, using one of black America’s oldest places of congregation, the church, to be in the front lines of this social movement, along with Green the Church.